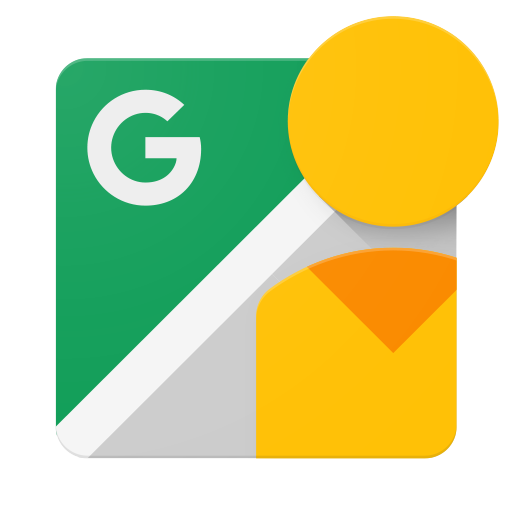 Google Street View hit 2.0 back in September, and everyone who captures, uploads, and manages photo spheres cheered in unison. Performing any of these actions became easier after the app separated from Google Maps, but there is always room for improvement. 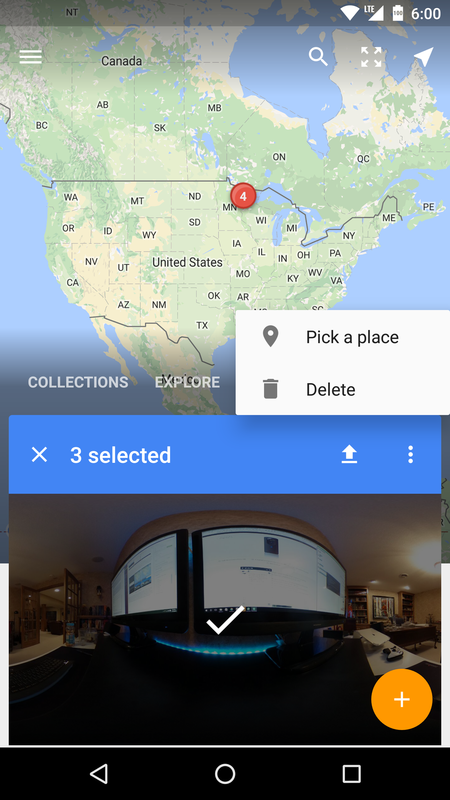 Today, Google released a new version that adds a few features that will make life a little easier for doing certain things. 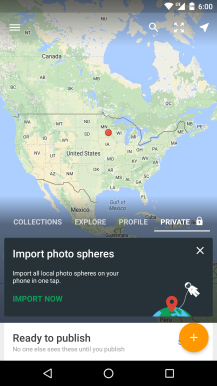 Importing photo spheres has been on my wish list since the app was first launched. 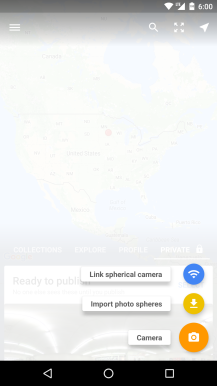 In the past, I have taken photo spheres using the Google Camera, which were stuck outside of Street View. 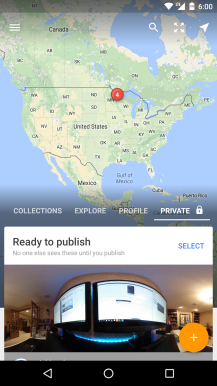 Now, I am able to upload all of my old photo spheres and have everything located in one spot. The new upload process is as easy as you would expect. 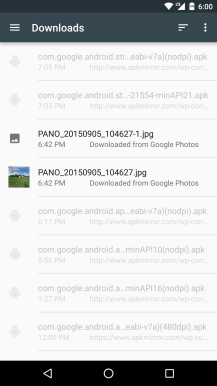 Tapping the FAB and selecting "Import photo sphere" opens the usual Android file explorer. 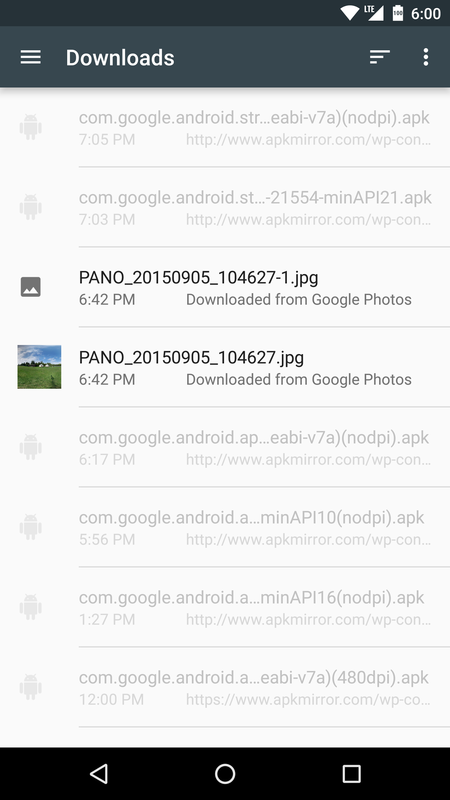 Uploaded files go into your Private section. 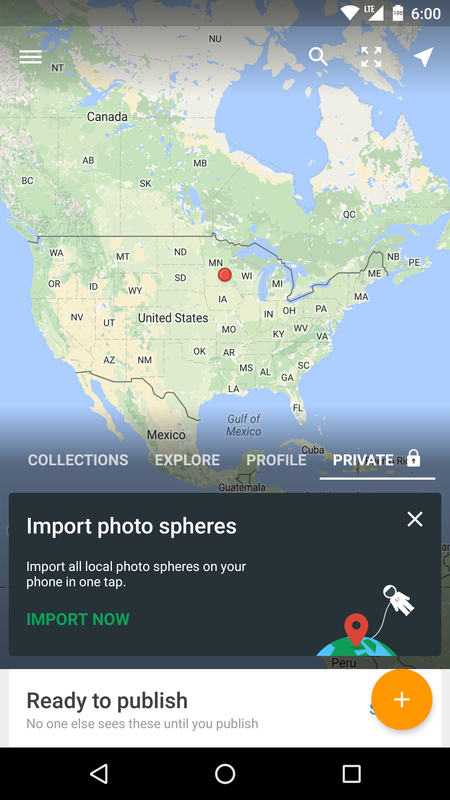 You will need to upload it again inside the app if you want your photo sphere to appear in Google Maps. The latest update changes the FAB from a camera button to a "+" sign. 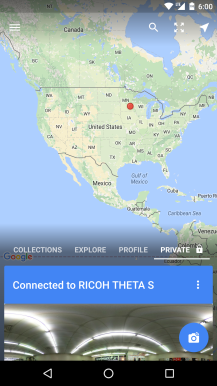 The built-in camera, importing photospheres, and connecting to a spherical camera are all located here. Linking to a camera was previously in the hamburger menu. 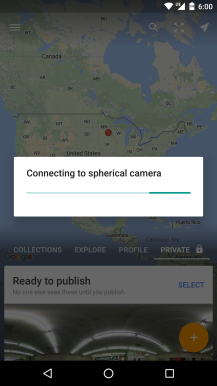 As mentioned in the changelog, there are some improvements to spherical cameras that are linked to your phone. 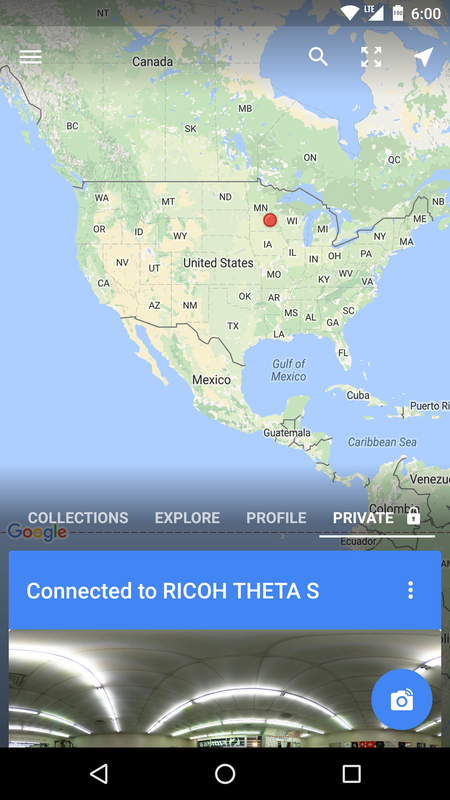 I own the Ricoh Theta S, and there have been quite a few issues linking it to my Nexus 6P. I have found that connecting to my camera is noticeably faster and more reliable after the newest update. 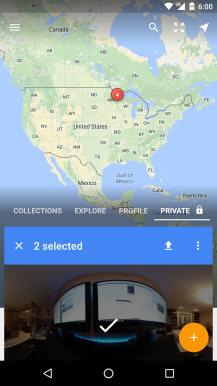 Street View now turns everything blue once you are connected to your camera, which is a nice visual cue that you're actively linked. The option menu displays the battery life of your camera, a much-needed number when the camera itself has no indicator of its battery life. Taking a picture is tapping the FAB, just like you're already used to. 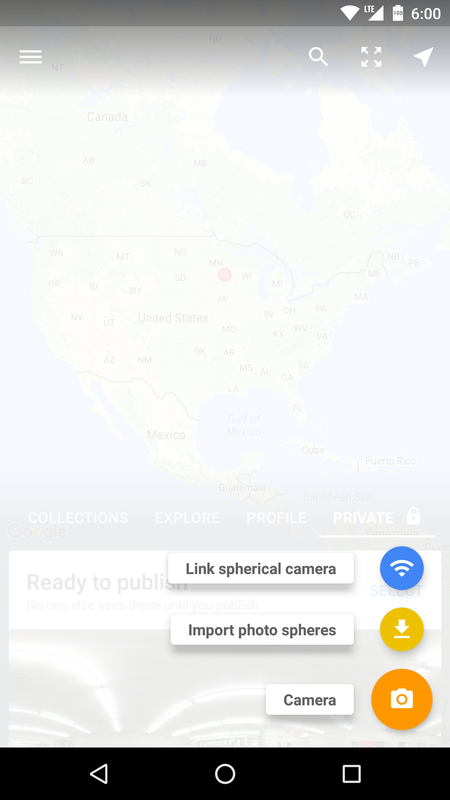 My only complaint is there is no way to disconnect from your camera without turning the camera off. The 3-dot menu would be a great place for this option. The ability to perform batch actions is pretty self-explanatory. You are now able to select multiple photo spheres and perform an action on them. Once again you are given a 3-dot menu, which allows you to add a place or delete all of the selected photos. Uploading your current selection is its own convenient icon. 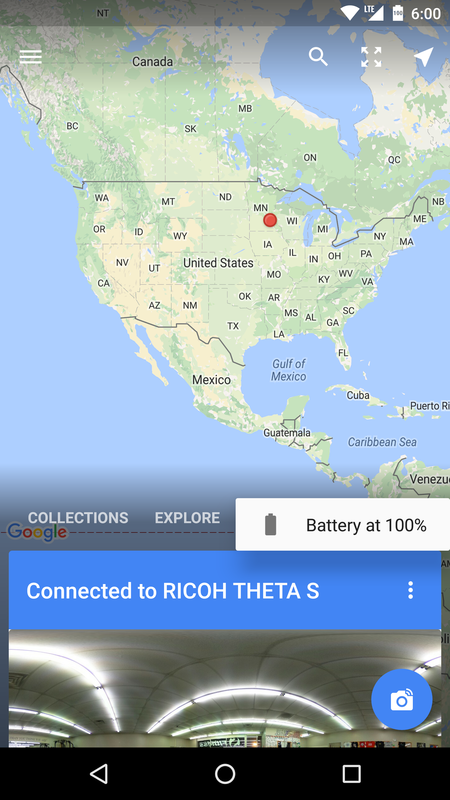 Overall, this is a small update with a few handy features. If you are wanting to explore the world by looking at photo spheres, I recommend downloading the Street View app below.